MECHANICSVILLE, Md. — Corey Maloney became the second No Box racer in the last three International Hot Rod Association (IHRA) Summit Sportsman Spectacular events to walk away with a $10,000-plus payday. Maloney of Pasadena, Md., won the Moser Engineering Saturday $10,000-to-win top prize by beating Box racer Hlindy Herman of Severn, Md., in the final round. Maloney had a .007 reaction time and drove his 1989 Ford Probe to a 5.656 elapsed time at 120.84 mph. Herman had a bit slower start in his 2018 Swingarm dragster at .024 and finished his run in 4.718 seconds at 145.27 mph. Herman racked up as well, winning $2,000 as the runner-up and picking up another $100 bonus as an IHRA Summit SuperSeries member. He also won a specially designed helmet by Jerron Settles of Imagine That Customs. It was the second big win of the night for Maloney, who won the $1,000 No Box bonus with a win over Tony Mattera of Mechanicsville, Md., in the final. Maloney posted a 5.675-second run at 118.30 mph after a .029 reaction time. Mattera, who was slightly faster with a .026 start, ran a 6.600 elapsed time at 98.44 mph. 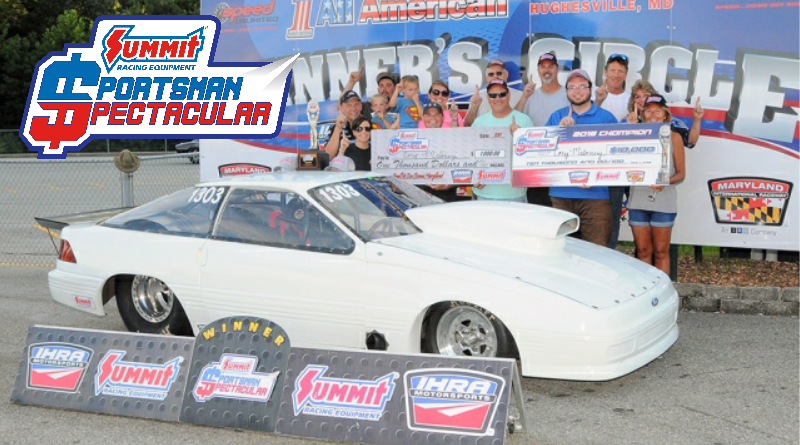 Mattera also picked up a $100 bonus as an IHRA Summit SuperSeries member. Hunter Groat of Hollywood, Md., won on a holeshot in Junior Dragster with a .020 reaction time to .070 advantage over runner-up Tyler Sandy of Mechanicsville. Groat, won the $700 winner’s purse and the $250 IHRA Summit SuperSeries bonus, with a 7.962-second pass at 80.12 mph. Sandy went down the track in 7.940 seconds at 80.56 mph. Action continues Sunday at Maryland International Raceway with both the Box and No Box racers looking to capture a $5,000-to-win prize.